The mesites (Mesitornithidae) are a family of birds that are part of a clade (Columbimorphae) that include Columbiformes and Pterocliformes. They are smallish, near flightless birds endemic to Madagascar. They are the only family with more than two species in which every species is threatened (all three are listed as vulnerable). There are two genera, Mesitornis (2 species) and Monias (subdesert mesite). Historically, mesites have been allied with the doves and the dippers. While the latter is certainly incorrect, there is some indication that they might indeed be closer (though not very close) to the Columbiformes. The purported gruiforms kagu and sunbittern (and possibly the extinct adzebills too) might also be not-too-distant relatives. 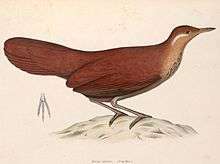 These latter taxa, remarkably, were all only tentatively placed in the Gruiformes, and are apparently all of Gondwanan origin; like the mesites, the kagu and sunbittern are among the rather few birds possessing powder down. Still, the data hinting at a possible relationship between the "odd gruiforms" (and possibly pigeons) is by no means robust enough to draw a firm conclusion. (Fain & Houde 2004) Arguably, they might be considered an order of their own (Mesitornithiformes) as has on occasion been done in the past, but unlike with the hoatzin, little phylogenetic research has yet been conducted on mesites. The DNA study of Hackett et al. 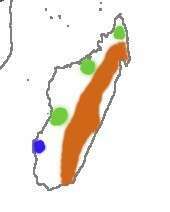 (2008) suggested that the mesites are a sister group of the doves, somewhat more distantly related to the sandgrouse, tropicbirds, grebes, and flamingos, within the proposed "Metaves" clade. Other researchers have been unable to confirm the "Metaves". Recent phylogenomic studies support the grouping of mesites, sandgrouse and pigeons forming the sister taxon to Mirandornithes. The mesites are forest and scrubland birds that feed on insects and seeds. The brown and white-breasted mesites forage on the ground, gleaning insects from the leaves and under them, as well as low vegetation. 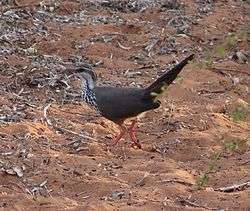 The subdesert mesite uses its long bill to probe in the soil. Other birds, such as drongos and flycatchers, will follow mesites to catch any insects they flush and miss. Mesites are vocal birds, with calls similar to passerine song, used for territorial defence. Two or three white eggs are laid in a stick-nest located in a bush or low branch. The Mesitornis species are monogamous; Monias benschi is polygamous and unlike the other two shows significant sexual dichromatism. 1 2 Jarvis, E.D. et al. (2014) Whole-genome analyses resolve early branches in the tree of life of modern birds. Science, 346(6215):1320-1331. ↑ IOC World Bird List v6.3 . "IOC Names File Plus 6.3". Retrieved 30 August 2016. ↑ "Part 7- Vertebrates". Collection of genus-group names in a systematic arrangement. Retrieved 30 June 2016. ↑ Fain, M.G. & Houde, P. (2004) Parallel radiations in the primary clades of birds. Evolution. 58(11):2558-73. ↑ Fain, Matthew G.; Houde, Peter (2004). "Parallel radiations in the primary clades of birds". Evolution. 58 (11): 2558–2573. doi:10.1554/04-235. PMID 15612298. ↑ Archibald, George W. (1991). Forshaw, Joseph, ed. Encyclopaedia of Animals: Birds. London: Merehurst Press. pp. 100–101. ISBN 1-85391-186-0.